Kristin and I are in Solvang, California, one of our favorite destinations in California. Kristin just blogged about the plans for this trip in late June. We returned to Solvang for the third time in two years because we enjoy the unique Danish ambiance, excellent wine, and temperate climate. 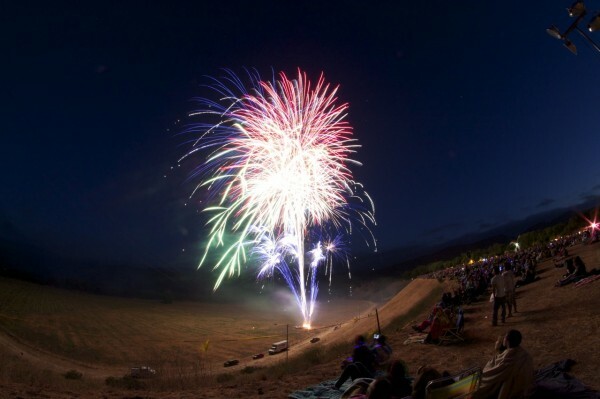 Although our vacation was planned starting on the 4th of July to take advantage of turning a midweek holiday into a 5-day weekend, Independence Day celebrations were not a priority in our trip scheduling. We knew we would likely see fireworks, but too our surprise, the 4th of July Celebration and Fireworks Show in Solvang was a trip highlight! The show is put on each year (this is the 19th annual) by the Rotary Club of the Santa Ynez Valley. Admission to the event is $5 for adults, and free for children 5 & under and for service members. In addition to fireworks at 9pm, gates open at 1pm with plenty of all-American food booths, live entertainment, games for children, and raffles. The event truly has a “small town” America feel, despite the many tourists that visit the area. View of 4th of July Fireworks in Solvang, California from our vantage point on a ridge adjacent to the Mission of Santa Ines. The location of the event is ideal for fireworks observation. The event takes place at the grounds of the Mission of Santa Ines, one of the historic California missions (see red area in map below with the cross indicating the location of the mission building). The mission is very picturesque, sitting high above vineyards in a valley to the southeast. During the show, crowds are situated along the ridge adjacent to the mission (see camera icon in map). 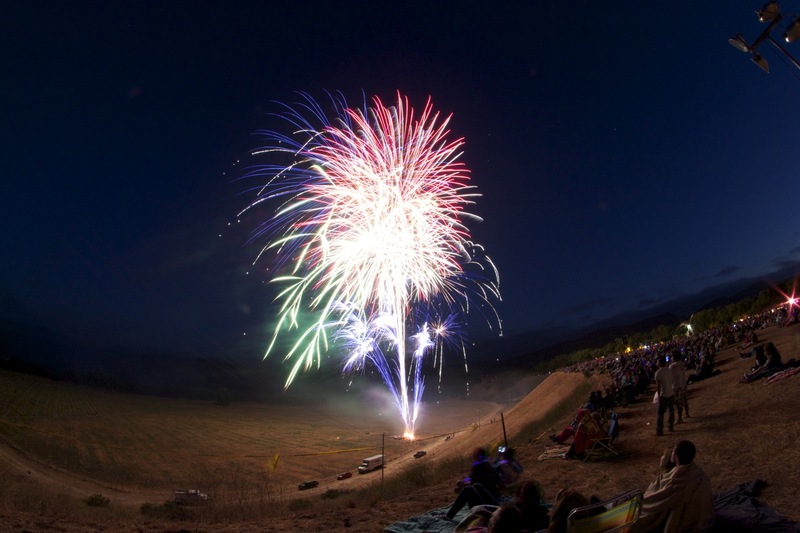 Fireworks are launched from the vineyards below (see fireworks icon). Even with the large crowds, we were able to find a front-row seat along the ridge. The photo above demonstrates our excellent vantage point. I used a fisheye lens to capture both the fireworks and the crowd. Map showing the location of the 4th of July Celebration in Solvang. Red shaded area depicts the grounds at the Mission of Santa Ines used for the event. 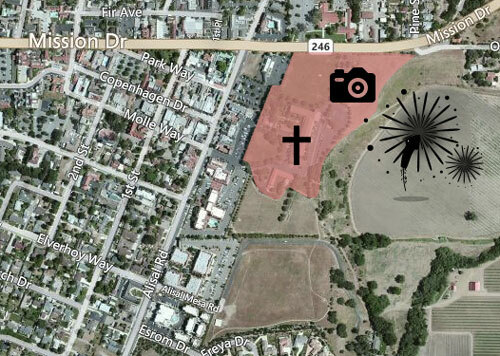 The cross indicates the location of the mission building, the camera is the observation area, and the fireworks icon demonstrates the launch location for the fireworks. Earlier in the day while wine tasting in Los Olivos, we were told that the vineyards below are actually part of the Couquelicot Estate. The tasting room employee mentioned the view from the vineyards below is amazing–but I don’t think non-vineyard employees can obtain access. A number of people watched the show along Highway 246, just north of the grounds. In my opinion, however, the $5 entrance fee for the view along the ridge is well worth the money. Solvang will certainly be on our short list for possible July 4th celebrations in the near future. We were very impressed with the fireworks display, and loved the “small town” feel of the event. We strongly recommend the experience to other travelers! This entry was posted in Travel and tagged California, events, experience, Solvang, Solvang 2012 Trip by Ryan. Bookmark the permalink.